Today is the Feast Day of the Nine Martyrs of Cyzicus: Sts. Thaumasius, Theognes, Rufus, Antipater, Theostichus, Artemas, Magnus, Theodotus and Philemon. They were part of a small Christian community in the largely pagan city of Cyzicus, which was located on a peninsula on the southern shore of the Sea of Marmara in what is modern day Turkey. They were from all walks of life, and all ages and were arrested and tortured for boldly proclaiming Christ. At the end of the third century A.D. they were all beheaded and buried outside the city. When the Roman Empire became Christian, their relics were uncovered, a church was built in their honor and many miracles occurred through them. From very early on, this hobby used maps of real places as the basis from which to build entire campaigns. My guess is that even without changing the names, most people would be unable to recognize this map as being a real place. Taking inspiration from real places adds to the realism of the campaign. If nothing else, the geography of a place makes sense because it is based on reality. From this firm foundation, it becomes very easy to create living, breathing campaigns. There was an ancient megalithic culture in the area that has left plenty of ruins to explore. For an FRPG, this is the perfect excuse for dungeons, an explanation for the origin of arcane magic and lost magic and/or an excuse to drop science fantasy elements into a campaign. The city at the top right of the map just south of the Black Sea is Byzantium. It is destined to become Constantinople, capital city of the Christian Roman Empire. Therefore, there is a built-in Civilization vs. Wilderness feel to this area with very serious end-game implications. Finally, take a look at this video from 60 minutes. 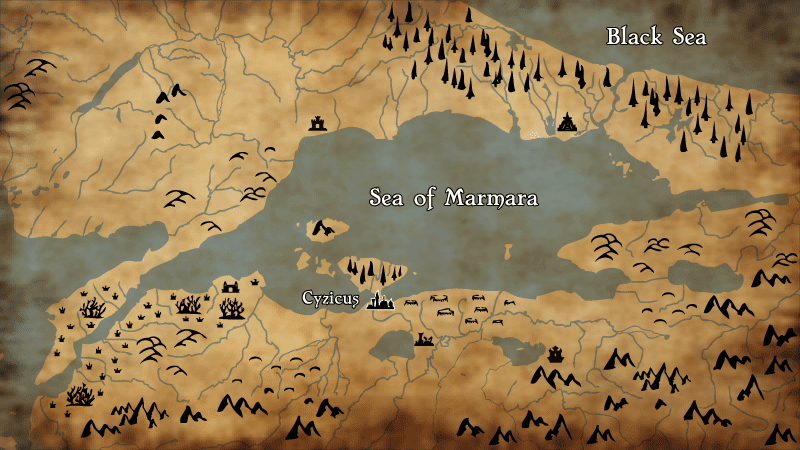 Though Cappadocia is south and east of Cyzicus and the Sea of Marmara, it is close enough that I don't think anyone would quibble if the otherworldly landscape inspired a few encounter areas on the above map. It is here that I have to make a confession. When constructing a dungeon for my own use, I rarely spend much time stocking the dungeon — it is my least favorite part of the whole process. In part, this is because I tend to be a more improvisational Referee through the use of Wandering Monster Tables. I like to be surprised. The other is that I just don't like writing room descriptions. When I occasionally do run a module, I find that these descriptions actually get in the way of game play. In fact, I have often gotten critical pieces of information wrong that have affected entire sessions (not that there is anything wrong with that, but it can be frustrating from my side of the screen). I do have some exciting ideas bubbling up as I continue to mediate upon this adventure; however, I am not excited about putting them down on paper. I don't want to just do this like every other adventure is done and therefore follow a path that frustrates me while I am at the table. Personally, I prefer a quick reference sheet for my dungeons at the table. Monster stats, treasure, short trap descriptions and a short description of the use of the room (but not of the room itself). However, I am beginning to see that there are some over-arching themes and issues that go well beyond this particular method. For my own purposes, the quick reference would be enough — I know what the over-arching themes are and can easily improv their impact on any given room or encounter; however, the end user would not. Therefore, I have a few questions: if I were to produce a .pdf, what would be your preferred method of room descriptions? What would be the most useful way for me to describe these over-arching issues? Do you have an extant example of a module that is easy to use at the table? Some of you may have noticed that I have not made a session report since February. This is because my group hasn’t played my campaign in a couple of months. This is in part due to my busy schedule in the Spring (one of the reasons you will never find me participating in the A-Z challenge), but it also has to do with the fact that the player of Dn. Goram has decided to pursue a post-graduate degree and will be leaving us in a scant few weeks. Therefore, we decided to allow him to dictate his preferences for his last few months of gaming with us. These two factors conspired against playing my campaign until now — not that my campaign was not part of the plan, but he has been our GM for the Pathfinder game my group plays in addition to Labyrinth Lord. We all decided to allow him enough time to get what he wanted out of the campaign. Fortunately, we also wanted to see him get a chance to retire Dn. Goram before we all said goodbye (for now). Beedo over at Dreams in the Lich House has been meditating upon the issue of the 15-minute wilderness encounter. He was wondering whether or not it is problematic that higher level characters can go nuclear on a wilderness encounter and thus move wilderness encounters away from the traditional resource management game associated with dungeon delving. As I said in the comments of that particular post, I understand wilderness adventures to have a different set of resources than dungeons that need to get managed, and therefore don’t see the 15 minute wilderness encounter day as a problem. This session is a classic example of this type of resource management and the kinds of problems that need to be solved. Dn. Swibish received a “friendly” letter from an assassin sent by Redwraith to kill him. They (mistakenly) believe that he has not only grossly neglected his duties, but has aided and abetted the necromancer Xerxes. The note informed Dn. Swibish that the assassin had been recalled to Redwraith because an army of the Black Tower (the sworn enemies of Redwraith) was beginning to mobilize. Dn. Swibish was given this information in hopes that he would prove his loyalty to Redwraith by doing his duty by fighting against this army of the Black Tower and thus make his impending assassination unnecessary. The former Winter King paid Ahkmed a visit. He informed the dwarf that there were members of the Winter Court that had fled rather than face their former ruler and make a choice to either die or give up being an elf to become a Melltithian. Should any be found, Ahkmed was asked to kill them. In addition, the former Winter King asked to speak with Hornet, Ahkmed’s sword. She was given the opportunity to become a Melltithian herself. With Ahkmed’s consent, she did. In turn, Ahkmed was asked to seek out other Bane Weapons in order to allow the elves within to make the same choice. Ahkmed had been building an underground house in Headwaters. Unfortunately, all construction has stopped because an inter-dimensional portal has been uncovered. It randomly opens and closes. When something walked through and attacked the workers, the house was sealed shut until further notice. The party found out that the elf that they rescued from the Toadmen is a member of the Winter Court. One of the items that the party found in the lair of the Toadmen was an egg. It hatched. Fortunately for the party, it was Grak who claimed the egg, because he had convinced Fidgewik that he no longer needed his ring that protected him from petrification. This likely saved Grak’s life because what emerged from the egg was a cockatrice. Coleman the fighter is the proud owner of a boat (this is how he chose to convert is gp into xp). The captain he hired is an experienced merchant and has offered to begin making trading missions on behalf of his employer. The bishop of Trisagia sent a missionary to the Elflands to supervise the construction of the church Dn. Goram commissioned to be built there. As a result, several members of the Summer Court have converted, including one that was about to go through the ceremony to become a member of the Winter Court (because the vegan diet of the Summer Court was no longer able to give her any nourishment). As a result, she chose to die a natural death — something not seen in the Elflands for over a millennia. When the Winter Court found out that this choice was due to the new Istinite Church in the Elflands, they became very upset. Already shaken by the loss of their king and many of their most senior members, tensions in the Elflands are very high. It was this latter situation that interested the party the most, because they figured they could smooth things over in the short term by returning the rescued elf, thus restoring a member of the Winter Court thought to be lost. Indeed, this did ease things in the Elflands quite a bit. The party then decided to go back to the abandoned monastery and search for the Well of Chaos when a wilderness encounter entirely changed the complexion of the session. My random tables determined that a green dragon had recently decided to lair in the area. The party saw it flying overhead and proceeded to try and get its attention. Unfortunately for Gillek, they succeeded. He failed his saving throw and was immediately killed by the breath weapon. Before the dragon was able to unleash another cloud of chlorine gas, however, Grak threw his cockatrice at it. Amazingly, the dragon failed its saving throw. Getting Gillek reincarnated (he specified reincarnation rather than raise dead because his whole career has been about taking dangerous chances — like getting the attention of a green dragon). Getting a group of dwarves to cut the now petrified dragon into pieces so that they could be reassembled as a statue in the town center of Headwaters. Finding the lair (and therefore the treasure) of the dragon. All of these required a different set of resources — the most important of which was time. The rest of the session was spent planning on how they were going to spend their resources to get all of these things done (and then how to safely transport the treasure once it was found). For my part, this was really interesting and highly entertaining. 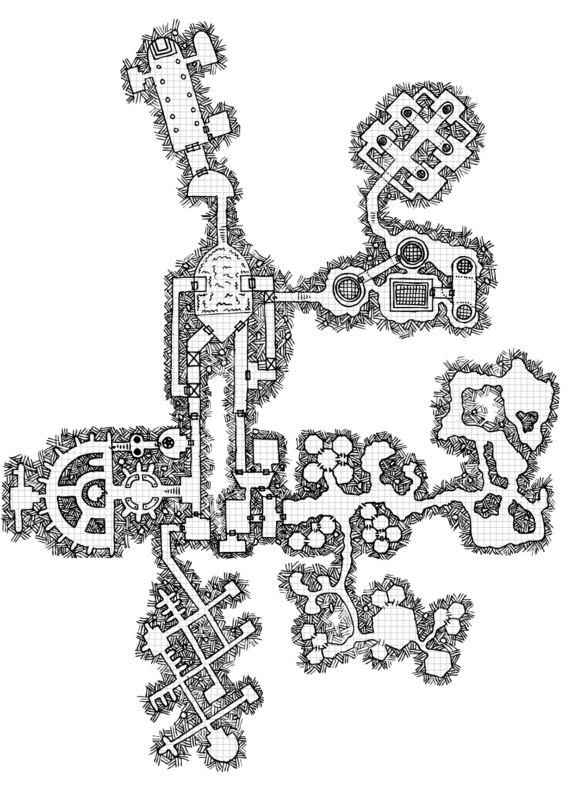 There were a couple of other encounters that forced the party to defend their goals and their resources. The 15 minute nuclear blast that took out a dragon not only didn’t take anything away from the game, but added a whole bunch of interesting complications. Gillek, by the way, was given a choice of rolling on the reincarnation table from LL or from the 1ed PH. Had he gone with LL he would have come back as a gnome. Instead, he is now a troll. The session ended with Dn. Goram gaining enough xp to reach name level, at which point his player handed me the character sheet and declared that Dn. Goram is officially retired. As a result, for the first time in the campaign, there is now an NPC cleric with the ability to Raise Dead. 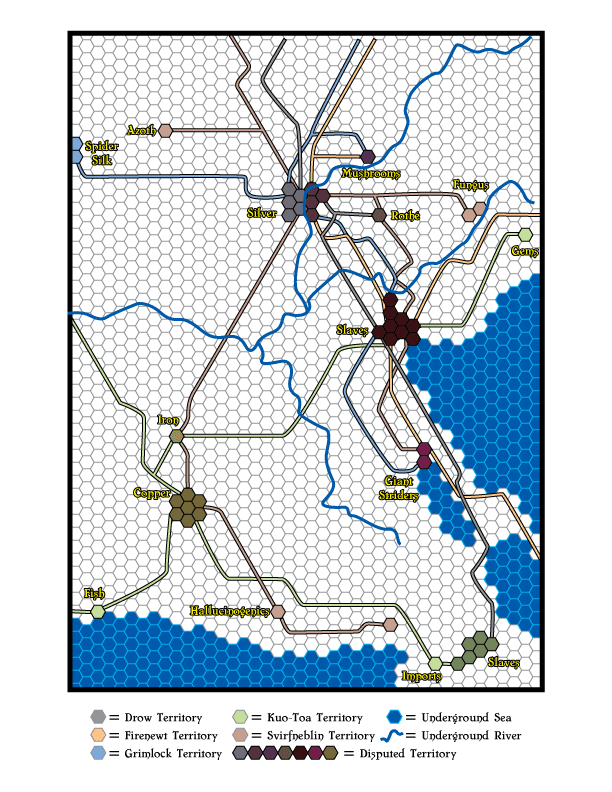 Yesterday in the comments of my post on using Empire Builder as a mini-game to set up an underworld/megadungeon, Roger of Roles, Rules & Roles reminded me of Iron Dragon, the fantasy entry of the Empire Builder line of games by Mayfair. Though out of print, Mayfair still has a page on their website about the game and even provide a .pdf of the rules. Thus, one has a ready-made list of commodities to substitute while playing out another Empire Builder game to set up a fantasy world/underworld. When compared to the North American game (which I used for my example in yesterday’s post) there are several direct commonalities (Cattle, Fish, Fruit, Iron, Sheep, Steel, Wheat) and several that are close enough as to be the same (Tobacco and Pipeweed; Tourists and Pilgrims; Wood and Lumber). The North American game also has a couple commodities that are fantasy appropriate that do not appear in Iron Dragon (Copper and Silver). Although I do not share my father’s passion for all things associated with railroads (he has a collection of timetables), his love has managed to rub off on me at least a little bit. My table top play time over the years has been equally divided between RPGs, miniature war-games and board games. 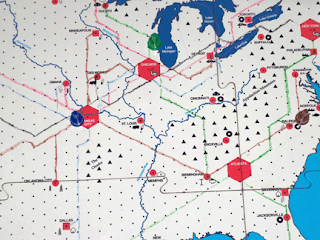 Of the latter, one of my favorites is the Empire Builder line of railroad games by Mayfair. One of my oldest daughter’s favorite ways of spending time with her dad is playing board games with me. Although her favorite is Settlers of Catan, recently she indulged me by requesting that we play Empire Builder a couple of times. For those of you who are not familiar with the game, Empire Builder is about building railroads in order to deliver various goods to various cities. Each player gets three demand cards, which have three potential deliveries and how much they pay. The goods are available only in certain cities, so each player spends money to build tracks connecting cities that have goods to cities that need those goods. 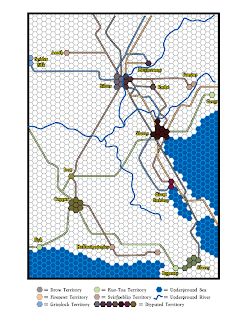 The first player to $250 million while connecting the major cities on the map wins. I love mini-games that help inform game and setting design. My favorite part of Traveller is the character creation mini-game — especially the expanded versions for military, scout and merchant careers. I find the process that GDW went through to produce the Traveller 2300 setting to be fascinating (I only wish they would let me play so I could produce my own version of the universe). Of course, I adore How to Host a Dungeon. 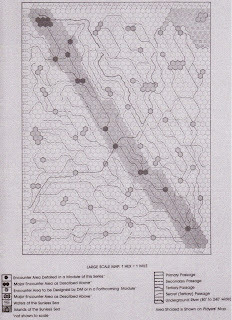 Therefore I began to wonder if it weren’t possible to create a large scale underground map ala Descent into the Depths of the Earth using a game of Empire Builder. Assign a classic underground race to each color (Black = Drow, Blue = Svirfneblin, Green = Kuo-Toa, etc. ); re-skin the various goods found in the game with appropriate fantasy stylings (cars = giant striders, tourists = slaves, cotton = spider silk, etc. ); and then play the game. The race that wins become the dominate race of the underworld, with pecking order depending how the game ends. Railroads become underground passages. Cities become encounter areas, with major cities being major dungeons. The goods represent what encounter areas have in abundance. The various colored railroads determine who controls these encounter areas and which ones are in dispute. Though this might seem a bit sparse (it is only part way through a whole game), there is still a lot of implied information here. For example, this provides some semblance of an under-earth economy. Goods are being traded or raided for. Therefore, when a party of adventurers clears out a particular encounter area, whatever goods that area produced is going to become scarce. The whole system and map will have an organic reason for adjusting to the presence of the adventurers. Does another faction try to reclaim what the adventurers have cleared out? Does the shortage heat up conflict in the underworld? Who benefits from this conflict? In the end, it is a fun way to create a living, breathing underworld that will have enough basic information about it to really make it sing when adventurers come to play. Today is the Feast of the Hieromartyr Januarius, Bishop of Beneventum (which is in central Italy). As might be guessed, the term Hieromartyr refers to a martyred saint who happens to be bishop (or hierarch). Januarius was arrested for being a Christian during the reign of the emperor Diolcletian (A.D. 284-305). Menignus, governor of Campagna oversaw the trial. What followed is rather typical of hagiographical accounts of martyrs from this era. Menigus first had the saint thrown into a furnace. Januarius emerged unharmed. The governor then had the saint beaten with iron rods until bone was exposed. This torture caused a pair of Christians (Desiderius and Faustus the Deacon) in the crowd to weep. They, too, were arrested and all three of them were taken to the city of Puteolum. In jail, they met with other imprisoned Christians — Euchtychius and Acution as well as Sossius and Proculus the Deacons. The next morning, all of them were led out into the arena to be prey for animals; however, the beasts would not touch them. Claiming that the Christians were performing some kind of sorcery, the governor Menigus was struck blind. Although Januarius prayed for the governor’s healing when asked, Menigus still would not relent on his claim of sorcery even after he regained his sight. He had all of the saints beheaded before the walls of the city. From an FRPG standpoint, the most inspiring part of this story actually happens centuries later. The Christians of the area collected the bodies of the saints as well as the dried blood of the hieromartyr. These relics have been the source of many miracles. For example, in A.D. 431, Mt. Vesuvius erupted but the lava never reached the city after the locals cried out for the help of St. Januarius. The most intriguing miracle, however, started occurring in the fifteenth century. The dried blood liquifies when it is placed near the skull of St. Januarius. This relic appears as dried blood coating the interior surface of a glass bottle. If detected for, the bottle itself radiates no magic; however, the blood does. When a clerical spell is cast upon the blood, it liquifies. If the blood is drunk, the imbiber will be healed 1d6 hp per spell level of the clerical spell cast. There will always be a residue left inside the bottle, which quickly dries up after the liquid has been drunk. This process can be repeated three times per day. Throughout my meditations on the FF, Anthony has repeatedly voiced an opinion that many (myself included) have accepted as D&D truth — the flumph is one of the most (if not the most) useless and silly monsters in the history of the game. He also implied a challenge (if only tongue in cheek) — one that I have taken half-seriously since. Though I am not yet willing to go so far as to make them a PC class, I do have in mind a way to rehabilitate the flumph in a way that not only makes them interesting, but potentially dangerous. In order to do this, I will take full advantage of the science-fantasy feel of the FF, though my inspiration for this rehabilitation is via the good ‘ol 1e MM. There is a great enmity between blink dogs and displacer beasts and the two creatures will always attack each other. Of course, the reason for the enmity is never given — allowing me free reign to do what I will with it. Since the two share similar powers (displacement and limited teleportation), I have always liked the idea that they are both creatures or descendants of creatures that hail either from outer space or another dimension. Though the 1e MM lists the displacer beast having a neutral alignment and only semi-intelligence, Holmes notes in his rule book that they have evil tendencies and makes no mention as to their intelligence. This, in part, helps explain the lawful good alignment of the blink dog. One of the powers of the flumph that I imagine helps solidify it as one of the most ridiculous creatures in D&D, is actually a key in which to tie the flumph to this relationship between blink dogs and displacer beasts. The “stink spray” defense mechanism is actually a perfect weapon against a displacer beast — it is an area effect 60° arc in a 20ft. cone. This implies that it is the flumph, not the blink dog, who fills the role of the hunting/pointer dog in the relationship. The flumph uses its defense mechanism to mark a displacer beast with the distinctive smell, making them easier to track and kill for the blink dogs. Falling back on the inspiration for the displacer beast — A.E. Von Vogt’s Coeurl — it is easy to imagine that the displacer beast is a kind of interstellar/extra-planar criminal. The blink dog, with its flumph “hound” is the grunt of an interstellar/extra-planar police force tasked with hunting down and arresting/killing the displacer beast. It is easy to imagine, therefore, that in a FRPG setting with a dash of science fantasy that the standard blink dog, displacer beast and flumph are the descendants of an ancient crash of a prison ship. The enmity of the blink dog and displacer beast stems from this relationship and has been passed down from generation to generation. In the meantime, flumph are the loyal hunting/pointer dogs cooperating with the blink dogs to hunt down and kill their nemesis. Thus, an encounter with the flumph, rather than bordering on the ridiculous, can be quite deadly. Since their “stink spray” is described as a defense mechanism, anyone unfortunate to stumble upon a flumph might get sprayed. This would then mark them as a criminal ally of the displacer beast and therefore for eradication by nearby blink dogs. The lawful good alignment, in this case, becomes dangerous because they will assume anyone marked by a flumph needs to be doggedly pursued until defeated. In Orthodox Christian liturgical practice, we use four different liturgies over the course of the year. Our default is the Liturgy of St. John Chrysostom. During specified weekdays during Great Lent, we use St. Gregory the Dialogist’s Liturgy of the Presanctified Gifts. In some places, on October 23 and December 26, the Liturgy of St. James the Brother of our Lord is used. On Sundays during Great Lent, on January 1 and for Vesperal Liturgies of some of the Great Feasts, we use the Liturgy of St. Basil. Of these, the Anaphora (which means offering and are the prayers surrounding the words of institution —Take, eat, this is my body which is broken for you and for the forgiveness of sins) of St. Basil’s is the longest. This length is primarily due to its expansiveness and inclusiveness — two things which, in my opinion, make it the most beautiful of all the Anaphora used by the Orthodox Church. Remember, Lord, those who are in the deserts, on mountains, in caverns, and in the chambers of the earth. Remember, Lord, those living in chastity and godliness, in asceticism and holiness of life. Thus, the prayer for those who are in the chambers of the earth, etc. extends beyond to those who live the monastic life. In context of an FRPG, therefore, this prayer could be understood as an example of the Church praying for (and thus condoning, if not endorsing) adventuring parties exploring the Wilderness, delving the depths of various dungeons and making forays into the Underworld. Of all the truly beautiful things of Great and Holy Week in Orthodox Christianity, the one that I enjoy the most is from the Vesperal Liturgy of the Resurrection that happens on Holy Saturday. The whole week is a journey from the tomb of Lazarus and Christ’s triumphant entry into Jerusalem; to the Last Supper and His betrayal; to the garden of Gethsemane and his arrest; His trial and torture; His crucifixion and burial; and finally, the opening of the tomb and His Resurrection. The Vespers of the Resurrection is this opening of the tomb. Arise O God! Judge the earth! For you shall have an inheritance among all the nations! All the banging of sticks is the sound of the shackles of the dead being broken and the basil leaves are both symbols of victory and of the garden tomb being opened for the resurrected Christ. It has been a long week, and therefore I forget which blog mentioned it, but in reaction to my own musings on a campaign in a fantasy version of Alaska, it argued that some of the best settings and campaigns are based on real places and practices. This is, in part, one of the basic assumptions of my Saintly Saturday blog posts. There are almost two thousand years of Christian stories and practice upon which to build a FRPG world. And as can be seen in the videos above, truth can be even more fantastic than fiction. I pray everyone has a blessed Resurrection. I must admit that I am torn in several directions today. While many of you are enjoying Easter weekend, I am readying myself for the marathon that is the Orthodox Christian Holy Week. Blogging will be spotty this coming week, if I manage to get in front of the computer at all. Thus today is going to be a bit of a smorgasbord. Lazarus is now two days in the tomb; he sees the dead of all the ages. There he has witnessed strange horrors, a numberless throng held fast by the bonds of Hades. Thus his sisters lament bitterly as they look on his tomb. But Christ comes to bring His friend to life, that a hymn may be raised by all in unison: "Blessed are You, O Savior, have mercy on us." In other words, what he saw was so harrowing that it marked him for life. I will grant, this is before Christ Himself went down into Hades to break open the brass gates and preach the Kingdom to the dead, but it still is a very interesting image, particularly for those whose campaign worlds do not have (yet) Christ or a Christ-analogue. For those who have qualms about Raise Dead and its affects upon their campaign world, the story of Lazarus gives a fascinating limiting factor — those that come back aren’t quite the same. Depending on how severe these consequences, a Referee could assign physical change (loss of Con, for example) or mental change (please roll on the insanity table, please). Such consequences would make some players think twice about using Raise Dead on their favorite characters. Born in 1865, in the Russian region of Pskov, St. Tikhon was a monk who became bishop of Alaska and the Aleutian Islands at the end of the 19th century. In 1900 his see was extended to include all of North America. He did much for the Orthodox Christians across the United States, including the consecration and establishment of several Churches, including St. Nicholas Cathedral in New York and St. Nicholas Church in Brooklyn. In 1917 he was elected as Patriarch of Moscow, just as the Bolshevik Revolution was about to sweep across Russia. St. Tikhon stood steadfast in the faith despite the utter destruction that followed in the wake of the communist revolution. He fell ill in 1924 and died today in 1925. Due to his sufferings, he is also considered a Confessor. It seems that the saints are insistent that I continue to work on my campaign based on a fantasy version of 18th century Alaska. Last week, I differentiated different types of magic in terms of pseudo-science. I mentioned that found magic would likely be alien technology. Colonial powers normally fight over territory not just for land, but for the riches that the land provides. Alaska is famous for both its gold and its oil; however, neither had been discovered until later into the 19th century. For the purposes of having something for Ruthenia and Albion to fight over, I think an interesting twist might be akin to a post earlier this week by Desert Scribe over at Super Galactic Dreadnaught — The Starship as Megadungeon. As I mentioned in the comments, this is an idea that I have been trying to implement for years, having been deeply affected by Expedition to the Barrier Peaks. Therefore I have a plan: in a remote region of fantasy-Alaska, there is a valley created by the crash of a huge space ship. Much of the regional conflict is centered around control of the valley and its access. Scattered throughout the region are also various escape pods and smaller vessels also involved in the crash. One candidate for these aliens are the Tuniit/Tunijuat or maybe they were slaves of the aliens who controlled the ship. 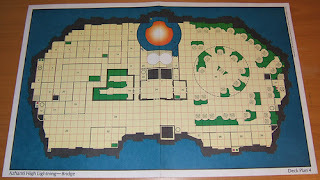 Regardless, I plan to have a huge spaceship as the tentpole megadungeon of the campaign. 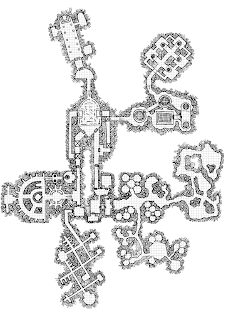 For those that worry about mapping such a dungeon, I offer a solution. Being an old Traveller Fan, one of my favorite aspects of the Traveller universe were all the various war games that helped form what became known as the Third Imperium. 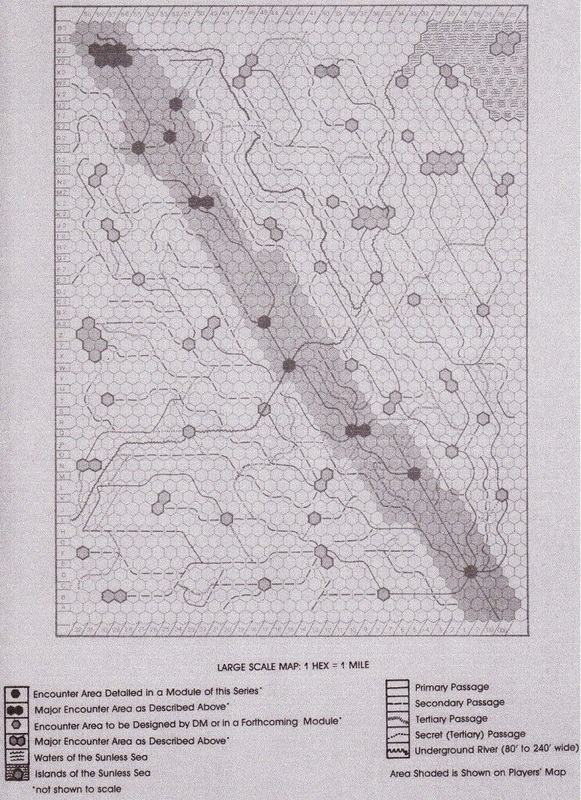 Among these board games is Azhanti High Lightning which is a game about combat scenarios aboard a huge space dreadnaught. The beauty of this game is that it provides fourteen full color deck plans. Even better, GDW has it available as a .pdf! Thus, all you need to do is figure out what kind nasties a group of adventurers will encounter therein, once they sneak by whatever fortification is protecting the valley (depending, of course on whether or not they are aligned to whoever happens to control said fort at the time). I must say that this whole experiment with 3x5 index cards to create dungeon maps has been very liberating for me. Especially in context of re-imagining the Slave Pits of the Undercity, being able to pay homage to the original material and yet transform it into something new has been far easier and far more satisfying that I ever expected. 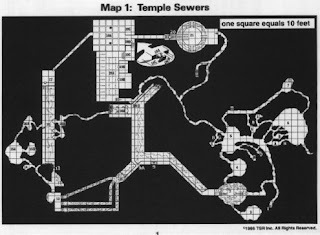 I was able to take those elements that I really like about the original map of the sewers underneath the temple in A1 and place them on individual 3x5 index cards. Then, I added those elements that I wanted to include on other 3x5 cards and began to fiddle, arrange and rearrange. BTW: If you want to see yet another application of this 3x5 index card idea that rocks, check out what Telecanter is doing here. Over the weekend I was fiddling with my 3x5 index card map idea when my children started to take a keen interest in what dad was doing. When I explained the concept, all three got super excited and insisted on helping. To my pleasant surprise, the three of them are well on their way to becoming creative dungeon masters. I am not ashamed to say that I swiped some of their ideas and cleaned them up. At this point, I have to make an admission. 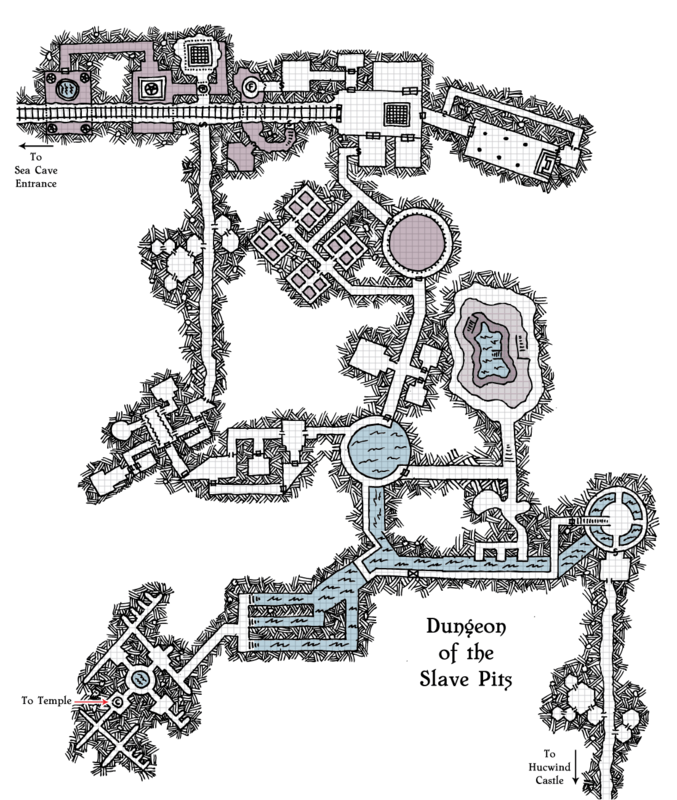 I have been struggling with making a map for the dungeon underneath Hucwind Castle for my re-imagined Slave Pits of the Undercity. Random generation, geomorphs and just doodling were not giving me the results I wanted. Not that I didn’t get good maps, they just weren’t evoking the kind of atmosphere that I wanted. 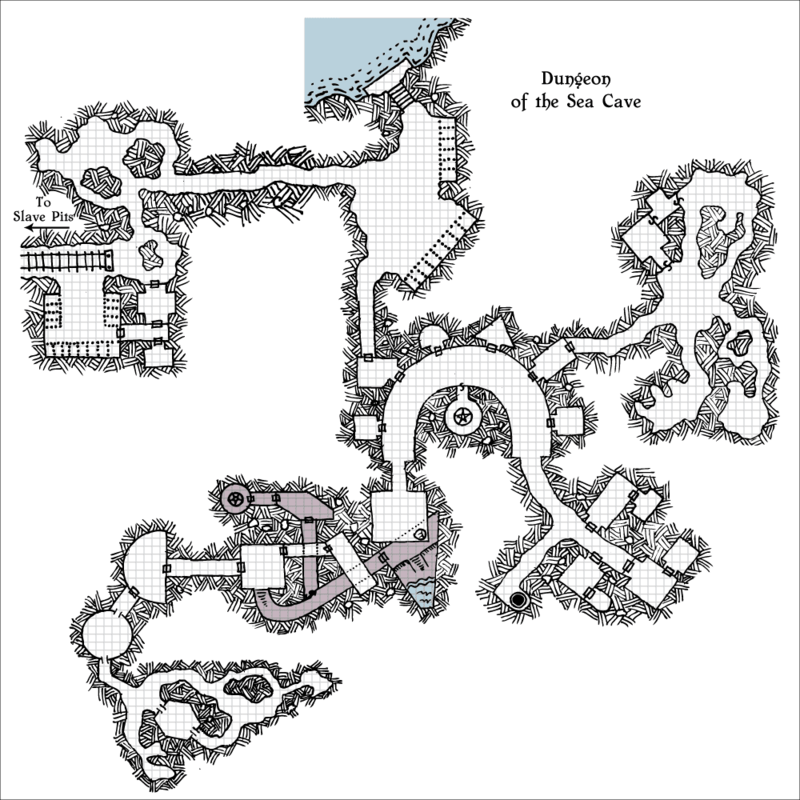 When my kids came to me with some of their sketches and ideas, I realized that some of them would make great additions to the very dungeon I was struggling with. It then dawned on me how powerful 3x5 index cards can be at making dungeon maps. Draw each feature on separate 3x5 card. Grab some of your favorite geomorphs, draw a couple other generic 3x5 cards plus a few “dead end” 3x5 cards (that have only one exit) and then start fiddling. Rather than having to re-draw a map every time you don’t like it, all you have to do is rearrange some 3x5 cards. 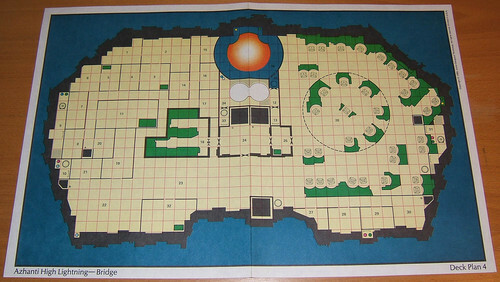 The result is almost like a mini-game of dungeon building. The end result is far more organic (and therefore makes more sense) than simply drawing a map. It is also, at least for me, really satisfying. I still have some fiddling to do, but this is vastly superior to anything I had come up with before.